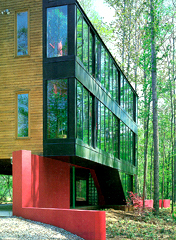 This passive solar house was commissioned by the owner of a steel supplier (and recycler) and sits on the banks of the Saluda River near Columbia, South Carolina. The owner supplied the framing steel, including the columns that lift the body of the house out of the 100-year flood plain. The design was an attempt to satisfy most of the relatively modest heating load passively and at the same time take advantage of the river and shade from native Water Oaks to defray cooling requirements. 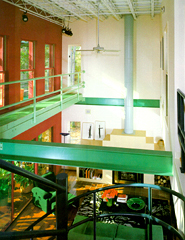 A large vertical collecting area uses standard sliding glass door panels, many of which operate for ventilation. In this climate, some significant glass is permissible on the river side, where openings promote cross-ventilation when desired. 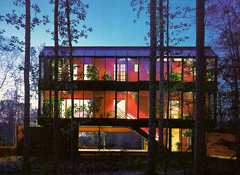 An open interior, with operating interior windows into rooms, allows air to move throughout the structure.